Fred Whitton Challenge Photos 2014 will be posted on Racing Snakes photo albums soon after the race, the pictures link will be live once the photos are published. 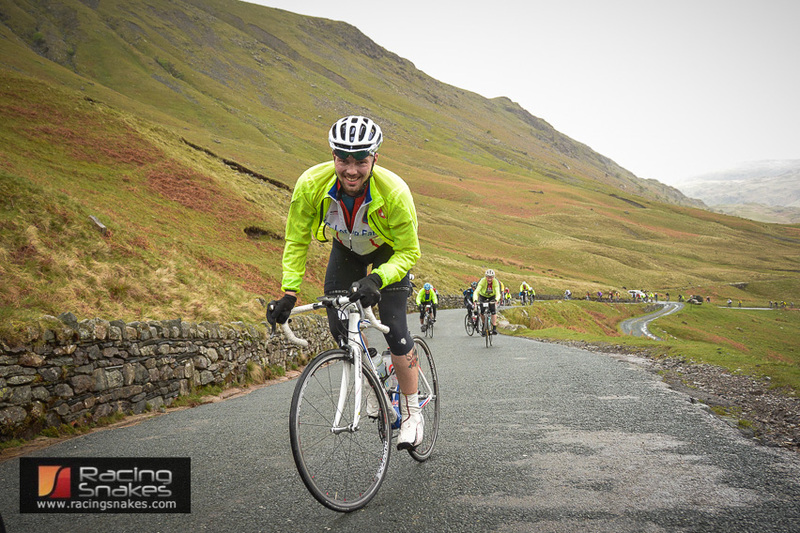 The photos of the Fred Whitton Challenge Cycling Sportive can also be seen on my Facebook page. The fastest time will be around the 5 hours and 50 mins mark with the slowest time around double that at 12 hours 30 mins. The Fred Whitton Challenge is expected to attract around 2000 riders. There are various feed stations and check points on the route. The ride is very well organised and has become the ‘must do’ sportive of many riders and thus has become one of the most popular rides in the sportive calendar and usually sells out well in advance of the ride. 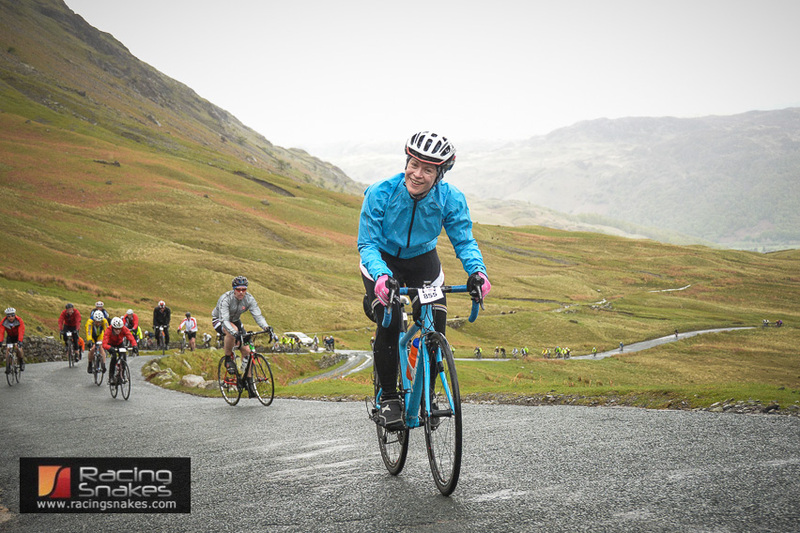 This entry was posted in Cycle Sportive and tagged 2014, challenge, Fred Whitton, Honister, Newland Hause, photographs, Photos, Pics on May 11, 2014 by racingsnakes. 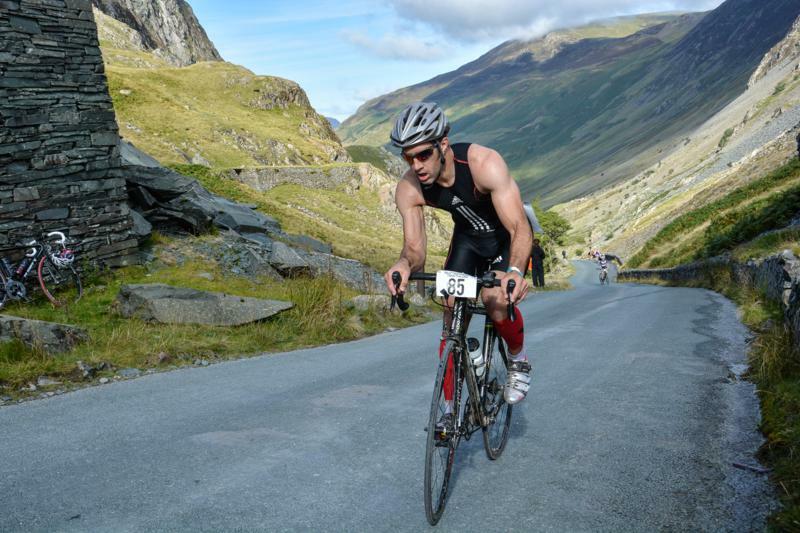 This entry was posted in Cycle Sportive and tagged 2014, ascent, climbing, Cycling, Fred Whitton, Photos, pictures, route, sportive on May 9, 2014 by racingsnakes. 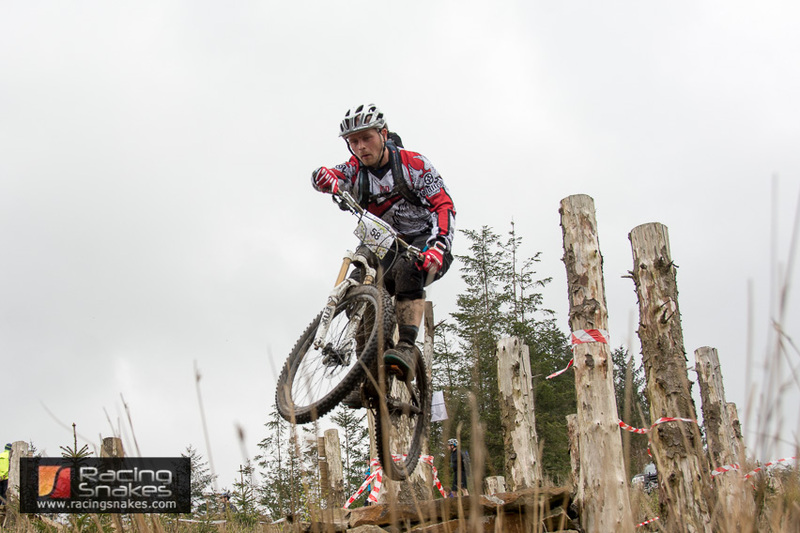 This entry was posted in Mountain Bike Enduro, Uncategorized and tagged Enduro, Gisburn Forest, Leap of Faith, Mountain Bike Enduro 2014 Photos, Pics on April 28, 2014 by racingsnakes. 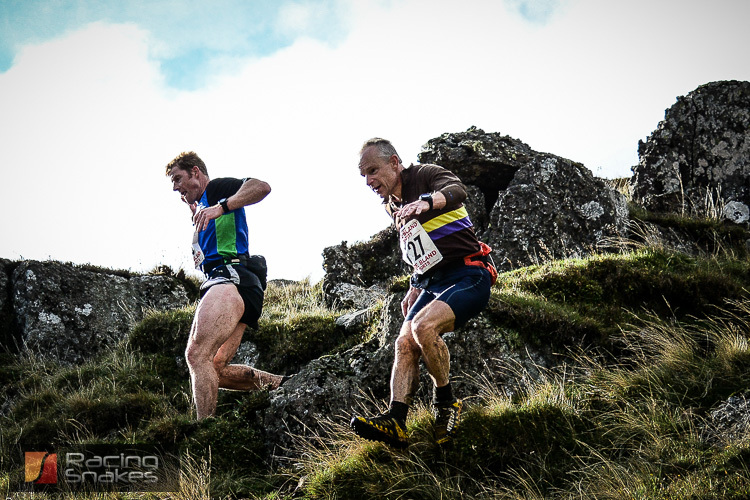 On Saturday 26 April 2014 the Three Peaks fell race takes place. 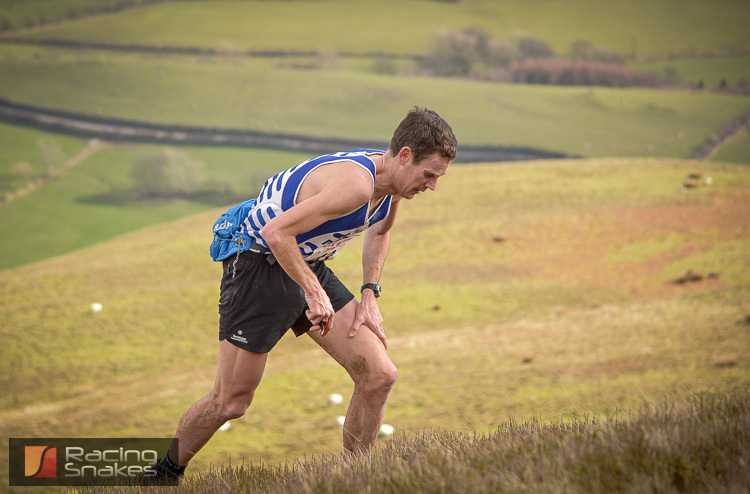 The 3 Peaks Fell race photos from 2014 (pics) can be seen on using this link http://racingsnakes.com/3PeaksFR. Pictures of the 3 peaks race were taken on the top of Penyghent and Ingleborough. 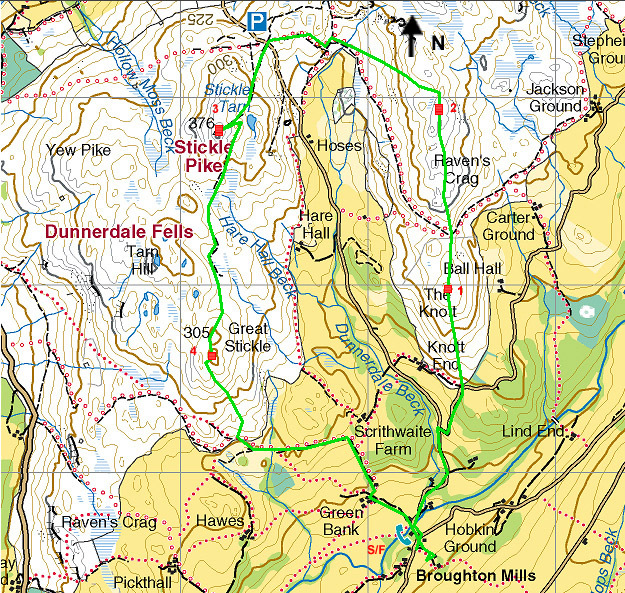 Distance of the 3 Peaks Fell Race is 37.4km (23.3 miles). 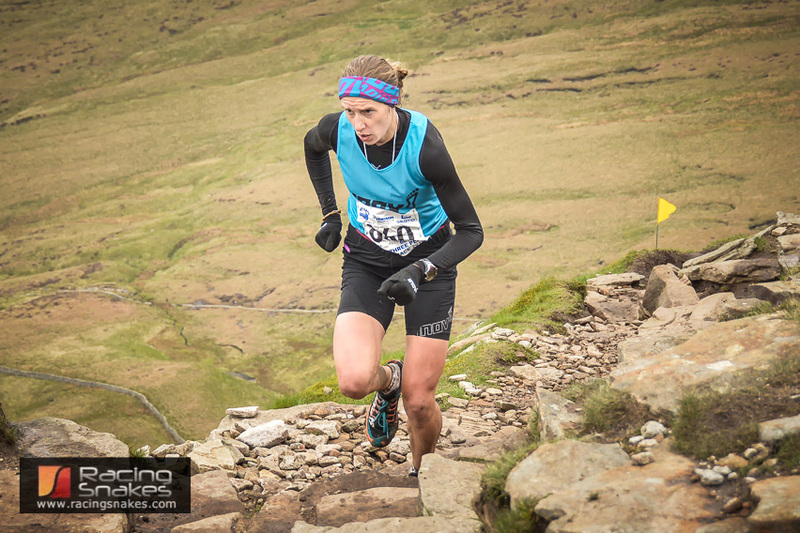 The 3 Peaks fell race has 1608 meters (5279 feet) of ascent. Andy Peace holds the fastest time on the current route, he set the 3 peaks mens record on 28 April 1996 with a time of 2 hours 46mins 03 secs. The ladies 3 peaks record was set in 2008 by Anna Pichrtova with a time of 3 hours 14 mins 43 secs. This entry was posted in Fell Race and tagged 2014, 3 3peaks record, 3 peaks fell race, 3 peaks fell race photos, fell race, Fellrace, Fellrunning, three peaks fell race, three peaks fell race photos, Three Peaks record on April 23, 2014 by racingsnakes. 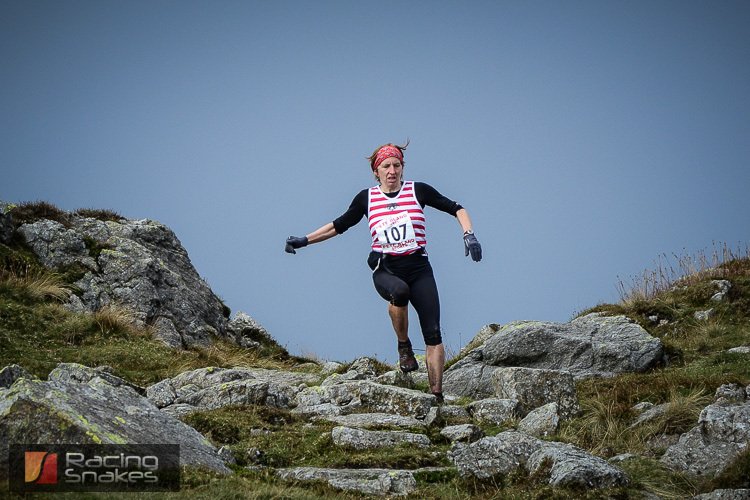 Racingsnakes has a great selection of fell running photos, pictures and images taken at Fell Races throughout the Country. Most of the big fell races have an an album of photos. 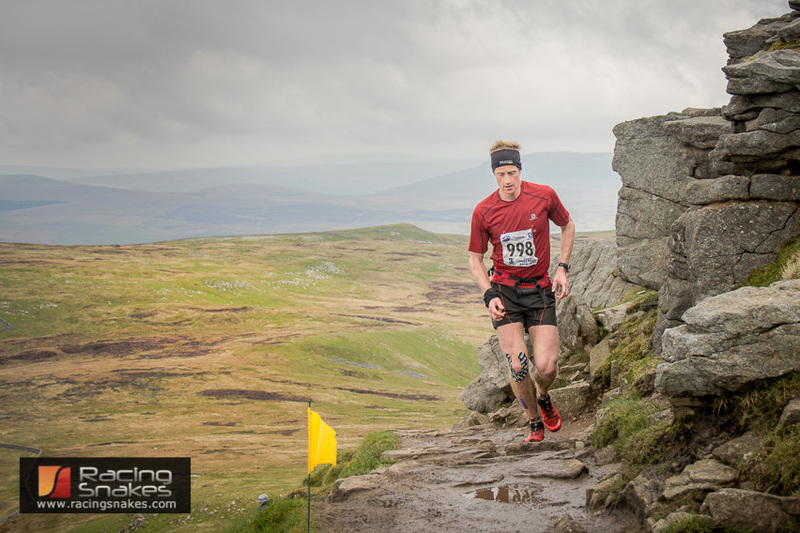 The fellrunning photos can be purchased from the website in both digital image or printed photographs. The images and Photos of the fell runners at fell races are contained in albums on the racingsnakes website on the photo page. 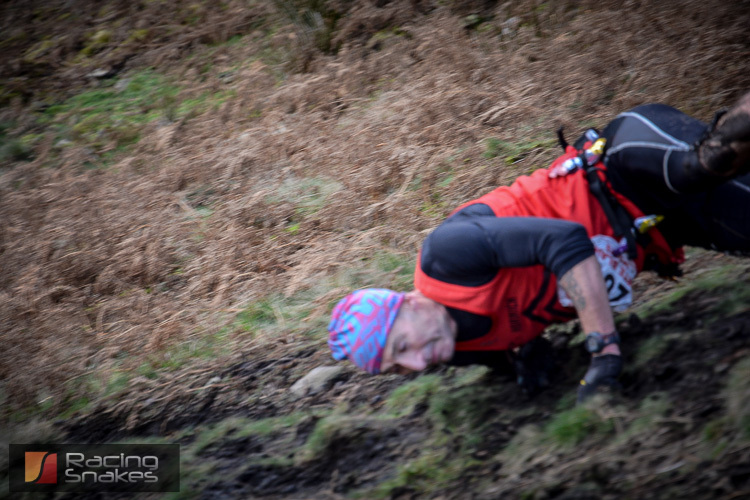 Many of the fell-running images and photos are also shared as albums on http://facebook.com/racingsnakes Most fell races take part in the North West of England in the Yorkshire Dales and the Lake District. 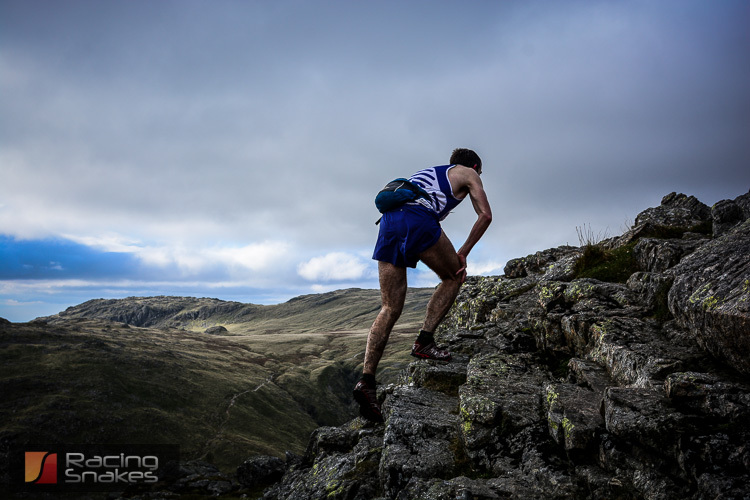 Many of the pictures of the fell runners have been taken on Mountain Tops and remote areas to capture the essence of the fell races. 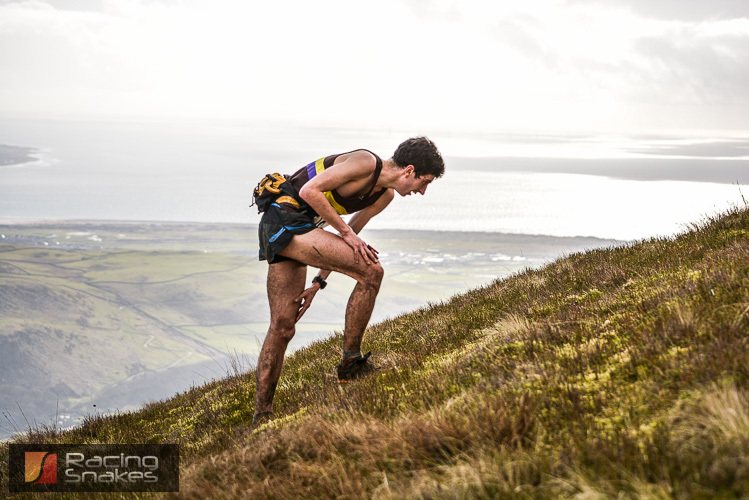 Fell running races are mostly carried out in the North of England on rough mountainous areas. Fell races are common in The Peaks District, Yorkshire Dales, Northumberland and the Lake District (Cumbria). The term ‘fell’ is taken from Old Norse name, fjall, meaning “mountain”. Fell running races take place throughout the year. The governing body for full running is the FRA (Fell Runners Association). Each year there is a British and an English Fell running championship. Details of the 2014 British and English races can be found on this link. Other notable fell races are the Lake District classic fell races (a series of fell races in the Lake District National Park), which are made up of the fell races, Ennerdale Horseshoe, Duddon Valley, Wasdale, Borrowdale, Three Shires and the Langdale Horseshoe. The Ben Nevis Fell Race – This race summits the highest mountain in Great Britain. The Snowdon Fell Race – This race summits the highest mountain in Wales and th The Three Peaks fell race – A 26 mile races around Penyghent, Whernside and Ingleborough in the Yorkshire Dales. Most fell races are listed on the FRA website and also racingsnakes.com although there are some held locally my other running clubs that do not appear on the website. Strict safety rules usually apply as the fell races often take place in remote and mountainous areas. This includes carrying some mandatory kit usually including full waterproof body cover, map, whistle and compass. Apart from the mandatory kit little else is required apart from some grippy running shoes (fell running shoes). Some races are marked out with flags and tape but most of the longer races are not and offer open route choice from control point to control point. The fastest person to run the course wins, there are often team prizes for running and fell running clubs. This entry was posted in Fell Race and tagged Fell Races, Fell Running, Images, mountain running, Photos, pictures, ricky lightfoot, sky running on March 11, 2014 by racingsnakes. The Great Whernside Fell race Photos can be seen on http://racingsnakes.com./Great_Whernside_fell_race.php. The great Whernside feel race starts at 11:30am on Saturday 26 October 2013 from the old campsite in Kettlewell. Photographs of the race will be available soon after the race. Kettlewell is a pretty village in the Yorkshire Dales National Park. The race route of the Great Whernside fell race leaves the old campsite and heads up for a steep start, this gets slightly easier for a while and heads up to summit Great Whernside. (not to be confused with Whernside – one of the Yorkshire three peaks). The fell runners descend at breakneck speeds and it is great spectators sport. Although this is a short race of 4miles, the route ascends (and descends) nearly 1600ft of climb with mixed terrain for the runners to cope with. There is a mix of good short grass fields, slippery rocks and boggy marshes which captures out more than the odd runner out. The fell race is usually quite well attended and the fastest runners can make short work of the course in just over half an hour. The organiser for this race Pete Jebb. Say hello if your at the race and I will certainly be trying to capture your best side for that great photo. This entry was posted in Fell Race and tagged fell race, great whernside fell race 2013, great whernside fell race pics on October 23, 2013 by racingsnakes. Cyclocross photos from Broughton Hall Rapha Supercross cyclocross race, Skipton 2013 will be posted on racingsnakes. 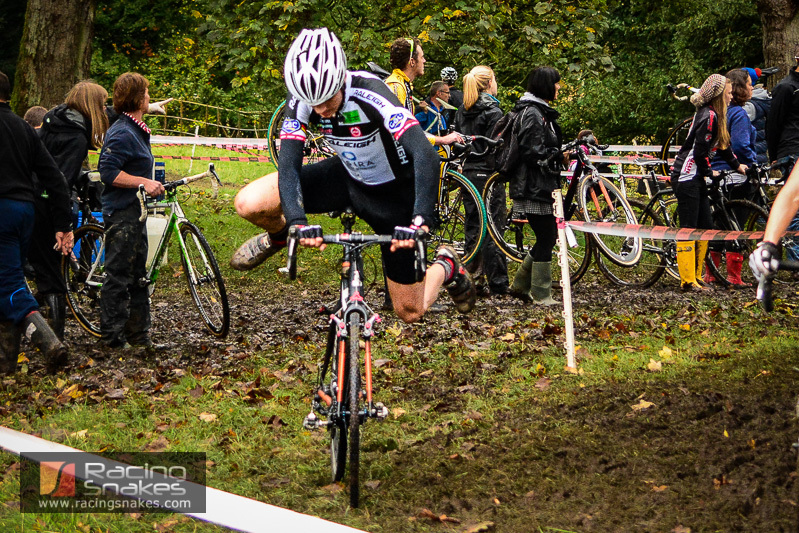 Saturday 19 October 2013 sees the first of the three race series of Rapha Supercross cyclocross racing. The cyclocross race will take place in the grounds of the majestic Broughton Hall near Skipton. Racing snakes will be to take photos. The pics will be available to buy in high res. Cyclocross is off road cycle racing, the bikles used are very similar to road bikes in that they have dropped handlebars and the same size wheels as road cycling. A lot of cyclocross bikes are now using disk brakes (similar to those found on some mountain bikes) over rim brakes. The clearance between the frame and the wheels tends to be greater than found on road bikes to allow the wheels to shed the mud. The tyre size is slightly wider than on a road bike. Some of the newer bikes will have 22 gears and tend to be easier gearing for climbing the steep hills. Frame size tends to be slightly smaller than road bikes to allow the riders better control. There are a number of races taking place from kids races to the high energy elete mens races. For the first time there is also a womens race. There is also a fun race with added obstacles including the ‘Spiral of Doom’ and the ‘wall of foam’. Entry to the event for the spectators is free and as well as the racing there will be music and refreshments. The fun starts at 10:15 with the under 10 and 12 year olds races. The mens elite mens starts at 1.30pm and the “fun” race starts at 2:30pm. There is guarenteed to be spills and thrills galore and the event will be well attended. The racers get little rest as the next in the series is the following day at Phillips Park in Manchester with a similar itinary. 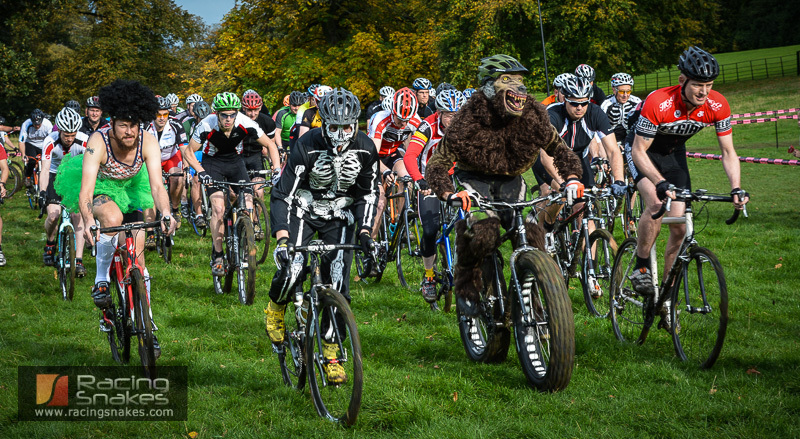 The final race in the series heads South to Alexandra Palace, London on 27 October. This entry was posted in cyclocross and tagged cyclocross photos skipton, Rapha Supercross Cyclocross Skipton, Rapha Supercross Cyclocross Skipton photos, Rapha Supercross Cyclocross Skipton pics on October 17, 2013 by racingsnakes. 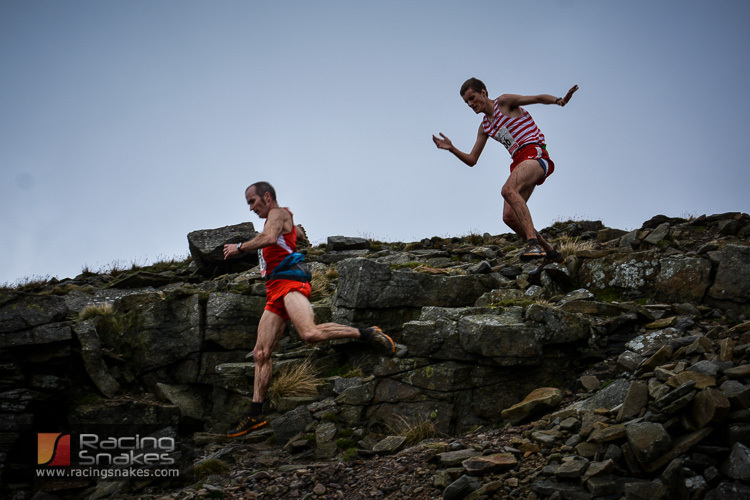 Langdale Fell Race Photos 2013. 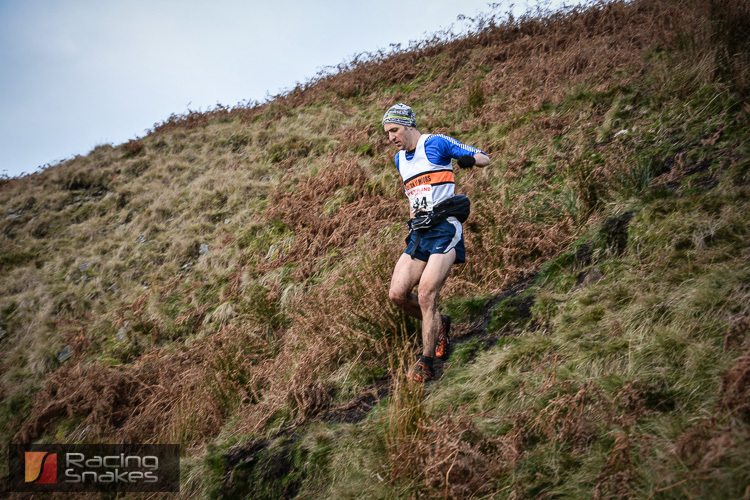 Photos of langdale fell race. On Staurday 12 October 2013 the Langdale Fell Race took place. I decided I would test a new camera lense out, it was all a bit last minute. The Langedale Fell Race sets off from near the Old Dungeon Gyhll Inn in the LangDales and sets off in the direction of the New Dungeon Ghyll. Just a quick plug for a friends bunkhouse which is located here, a great spot and close to two lovely pubs and more adventure than you can shake a stick at http://www.greatlangdalebunkhouse.co.uk/. The Langdale Fell race continues up the steep gully heading up towards stickle tarn. before heading in an anticlockwise direction taking in Pavey Ark, Pike of Stickle, Bow Fell, Crinkle Craggs and Pike of Blisco. My plan of action was to climb to the summit of the Pike of Blisco (705m) before the first runners arrived. The day was better weather than expected with pretty clear visibility on the tops except a bit of cloud cover on Bowfell. I was hoping to get some shots of the runners of the Langadale Fell Race summiting the Pike of Blisco capturing the stunning backdrop of the Langdale Peaks. From the summit of the pike you have a great view over towards Crinkle Craggs and it would be psooble to watch the runners descending to Red Tarn before the ascent. The first of the runners were spotted right on schedule and excitement grew on the peak. There were about ten people on the summit including marshalls all eagerly awaiting the arrival of the first runners. This entry was posted in Fell Race and tagged langdale fell race 2013, langdale fell race photos, langdale horseshoe fell race, langdale horseshoe photos on October 13, 2013 by racingsnakes.